World of Lint: Meat! Loaf! Live! 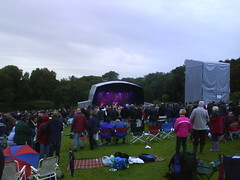 We went to see the mighty Meat Loaf last night at Castle Howard. It was a tortorous route that had been set up to get people there from the A64. Mental. Coming home was a little easier but also darker and wetter. It rained a lot all evening. It was fun though. He's perhaps not in his prime form but can still belt them out. And he is a legend after all.